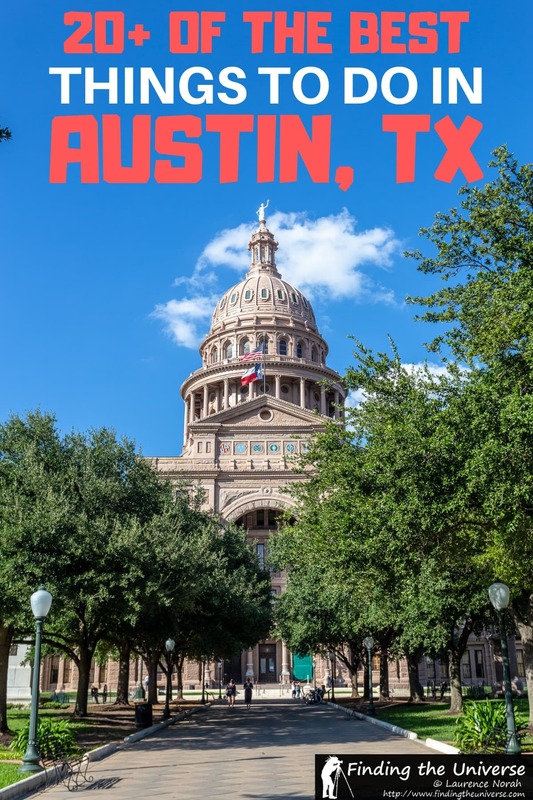 Home » Destinations » North America » USA » Things to do in Austin Texas – Plus Tips for your Visit! On a recent road trip in the USA, we spent some time discovering all the things to do in Austin Texas. 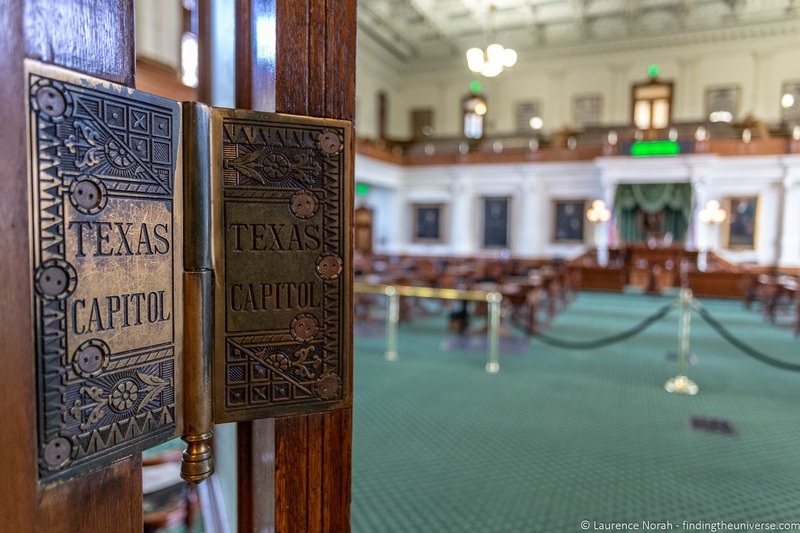 As the state capital of Texas, there’s a great deal more to do here than eat fantastic BBQ and wandering the Sixth Street bars. Although, of course, those things are also fun and worth doing too! In today’s post, we’re going to go through some of the best things we discovered that you can do in Austin. These cover a wide range of activities, from watching bats emerge at dusk, through to experiencing one of the world’s foremost music festivals, to eating incredible donuts. 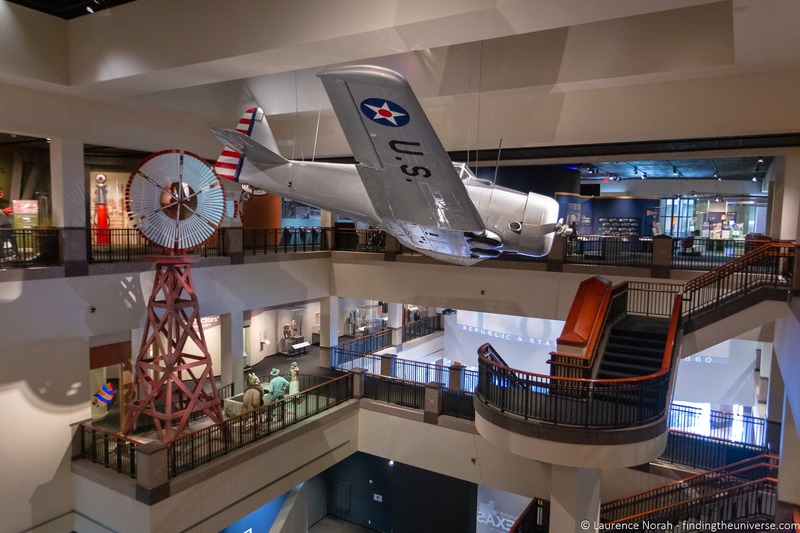 An excellent place to start your Austin exploration is at the Bullock Texas State History Museum. 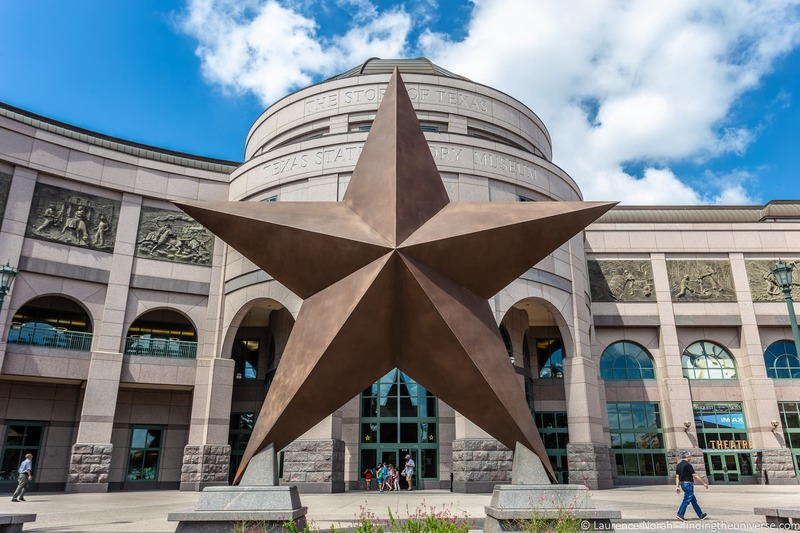 This museum tells the story of the state of Texas over the past 16,000 years! This covers prehistory, Native American culture, Spanish colonization, Mexican independence, the Battle of the Alamo and Texan independence. It then moves through more recent history, including the American Civil War, slavery and the Depression, the civil rights movement, and space exploration. Suffice to say, there is something here to interest pretty much everyone, and there are many hands on exhibits that will keep the whole family entertained. Entry for the museum carries an admission fee, and there is also the option to add on an IMAX theatre film for an additional price. Discounts are available for children, students, seniors and military. See pricing information here. The museum is open Monday – Saturday from 9am – 5pm, and on Sundays from noon to 5pm. It’s closed for some public holidays – you can see opening hours and times on the official website here. Did you know that from Spring to Fall, Austin is home to the largest urban bat colony in the world? Around 1.5 million Mexican free-tailed bats make their home under the Ann W. Richards Congress Avenue Bridge in downtown. Even better, at dusk every evening during this time, the bats emerge from their daytime slumber en masse, and head out to feed. There’s nothing quite like seeing 1.5 million bats swarm out from a bridge and making their way across the skyline in waves. There are a few popular spots to see the bats emerge. You can watch them from on top of the bridge or underneath the bridge (there’s a good viewing area on the north-east side). Other popular spots include the trails along the Colorado river. It’s also popular to take a sunset river cruise or kayak on the river to see the bats. There are also Segway tours and bike tours which include bat watching opportunities. The bats emerge most days around dusk, although weather conditions and other factors can affect this so sightings are not guaranteed. 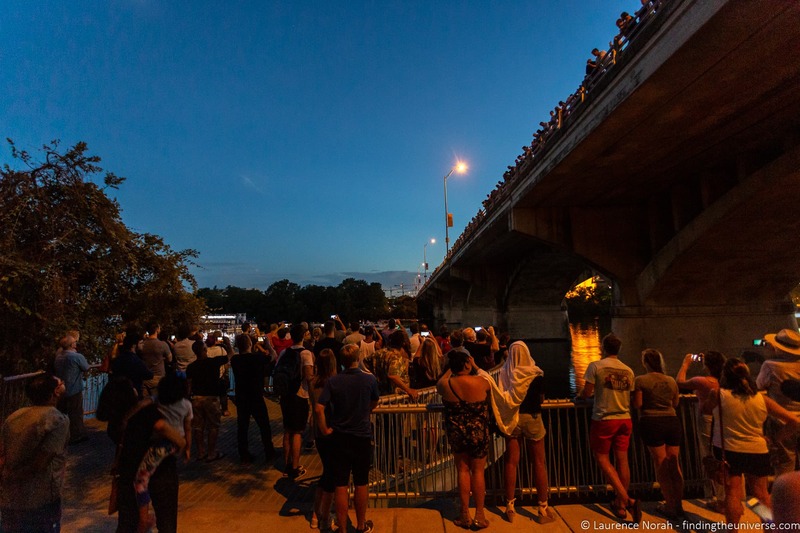 Be aware that watching the bats is one of the most popular things to do in Austin, so expect there to be a large number of people out and about! 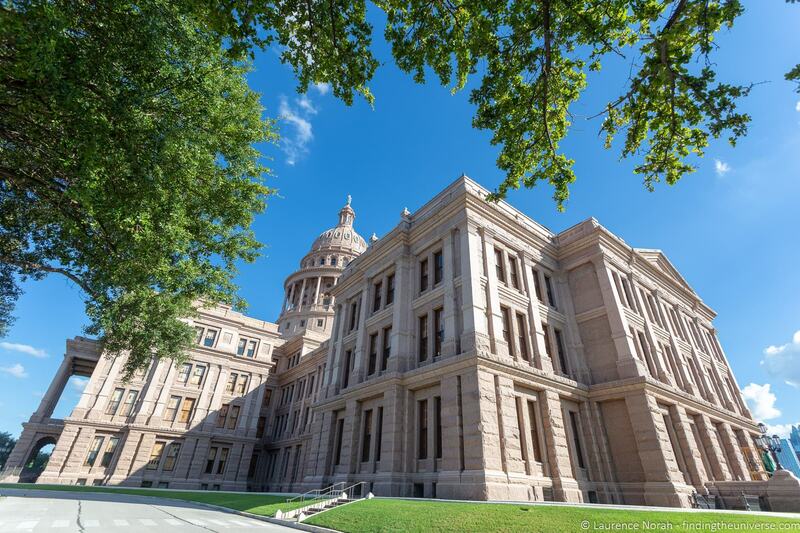 As the state capital of Texas, Austin is home to a beautiful State Capitol building. This was built towards the end of the 19th century, and when opened, it was the seventh largest building in the world! Naturally, since then, a fair few other buildings have overtaken it, but the State Capitol is still a mighty impressive building. It sits atop a small hill giving it an even more commanding presence, and it is well worth a visit. The best way to visit is to take one of the free guided tours. These are run every day, with tour times available on the official website here. 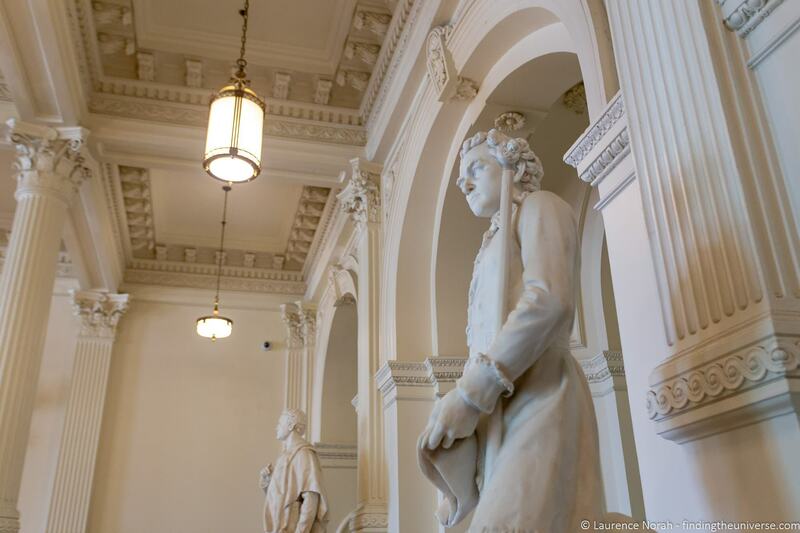 You can also take a self-guided tour if you prefer, with leaflets available in the Capitol Information room, the Capitol Visitors Centre, as well as online here. We really enjoyed our guided tour, which taught us a lot about the history of the building and Texas in general, as well as a bit about how the machinery of politics works here. A real highlight were the chambers were the senators and representatives sit. You can’t come to Texas without trying Texas BBQ, and Austin is certainly an excellent place where you can do that. BBQ styles and traditions vary the world over, and Texas BBQ is no different. There are four main variants of Texas BBQ from the different regions of the state, with variations in how the meat is prepared and cooked, as well as the sauce that comes with it. These differ from the variants of BBQ found elsewhere in the United States as each state and region has its own particular twist on barbecue. There are great debates as to where to get the best BBQ in Austin, and we certainly didn’t try them all. Some of them are so popular that you have to line up for hours. We love BBQ, but not quite that much. After chatting with various Austin locals as to their favourites, we ended up trying BBQ at Terry Black’s and Cooper’s BBQ. The former was my personal favourite. 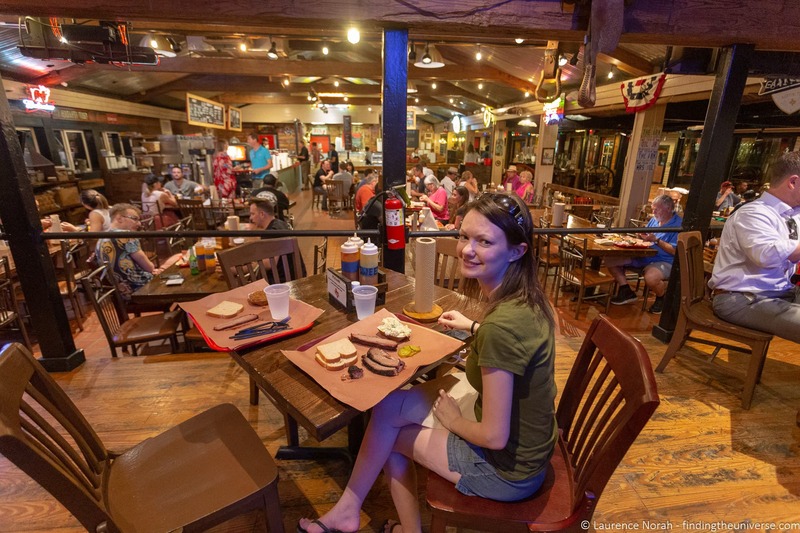 Other BBQ venues that are popular include Franklin’s (expect a line, lunch only), Black’s BBQ (from the same family as Terry Black’s), and Stiles Switch BBQ. If you’re interested in trying BBQ as part of a guided tour, there are a few options, including this food tour, this BBQ and brewery tour, and this BBQ and cycling tour! 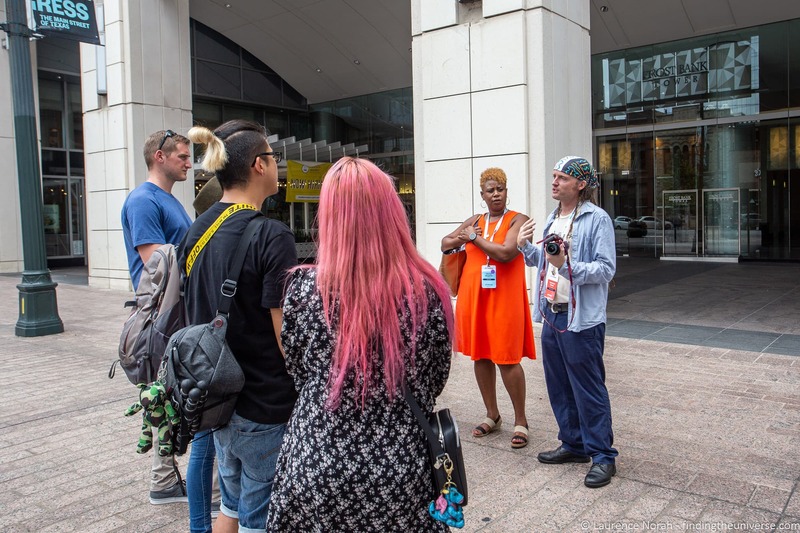 The annual South by Southwest festival, commonly abbreviated to SXSW and referred to as “South by”, is a conference which spans a massive variety of events across around 10 days in March every year. SXSW includes a music festival (SXSW Music), film festival (SXSW Film festival), and emerging technologies festival (SXSW Interactive). With talks, panels, film screenings and hundreds of live music performances, the festival takes over the downtown area of the city, and offers something for pretty much everyone. The music festival in particular, with its focus on new and emerging bands, is the largest of its kind in the world, and this is definitely the place where you’re likely to see the next big thing in music performing first. During SXSW accommodation becomes hard to find and much more expensive than at other times of year. Parking is also difficult, and traffic levels are elevated. So if you are not interested in attending SXSW, we’d recommend avoiding visiting Austin during the festival. I was lucky enough to be on the photography team for the SXSW music festival a few years ago, and got to spend some happy evenings photographing a wide variety of bands playing all sorts of different music. It’s definitely an experience, and if you love new music, new technology, or films, is one to consider attending. When I first visited Austin, I became confused because folks often referred to the town’s Lake, which on first glance I had thought was a river. It turns out I was partly right. The Colorado River (this is a Texas river, not the one on the South West of the USA!) has been dammed to form a series of reservoirs, largely for the purposes of flood control. So the main body of water that flows past downtown Austin is a lake, but also a river. Semantics aside, the main thing is that you can partake in various activities on and around the lake. These include lake cruises, stand up paddle boarding, kayaking, and fishing. 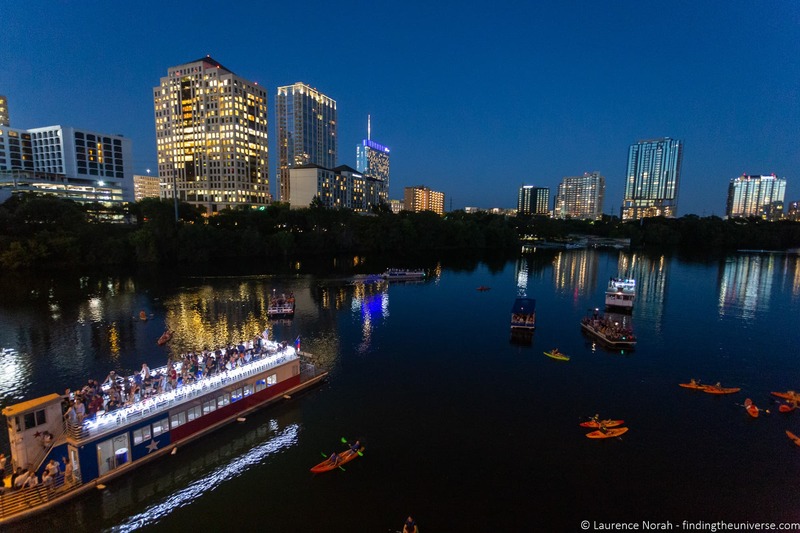 If you’re interested in a lake cruise, one is included on the great value Austin ATX pass, which also includes 25 other activities. You can also book other activities directly, such as this Kayaking Tour. There are also hiking and biking trails around the lake, with the Ann and Roy Butler Hike and Bike trail forming a complete 10 mile loop around the lake. Lyndon Baines Johnson, often referred to as LBJ, was the 36th President of the United States. He assumed this role following the assassination of President John F. Kennedy in 1963 in Dallas, Texas. LBJ (and Kennedy) was heavily responsible for many of the major reforms and events that happened in the USA throughout the 1960s, including civil rights reform, immigration reform, gun control and Medicare. It was also during his administration that NASA conducted the Gemini program, which paved the way for the USA’s successful moon landing. 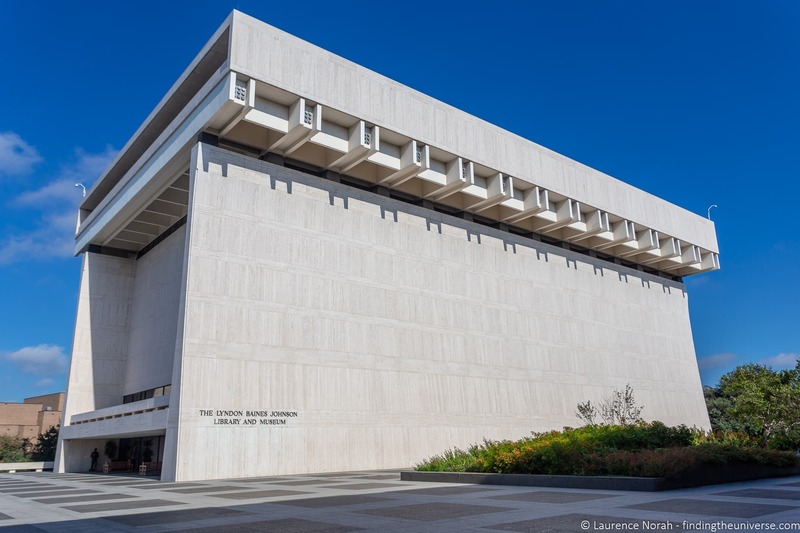 The LBJ Presidential Library in Austin is where you can come to learn all about LBJ, through a variety of exhibits and displays, including a 7/8th scale replica of the oval office. It’s also home to over 45 million historical documents. The library is open every day from 9am – 5pm, with some public holiday exceptions. There is a fee to visit the library, with discounts for seniors, military, students and children. See prices and full visiting information on the official website here. Entry is included on the Austin ATX Pass. For those of you interested in learning more about LBJ, you can take a visit to the Lyndon B. Johnson National Historical Park, which is found near Stonewall, Texas. Stonewall, Texas was where LBJ was born, and it is a small community 63 miles to the west of Austin. As well as growing up here, he spent a lot of time at the “LBJ Ranch”, both during his presidency and in the years following it. He also died here. A visit to the LBJ ranch makes for a good day out from Austin, and you can see the birthplace, home, ranch and grave of LBJ here. The easiest way to do this is with a tour like this. Yes, Austin is home to more than just BBQ! There’s an incredible food scene in the city, with a restaurant (or food truck!) catering to seemingly every taste. From the 24 hour cash only Voodoo Donut, to seafood restaurants, pub style grills, Tex Mex and fine dining – food lovers will definitely not go hungry. Austin is also home to a multitude of excellent food trucks, offering tasty food at great prices. You can see a live map of the food trucks in Austin here to find one near you at any given moment! If your idea of food heaven involves artisanal food and fresh produce, then you are definitely going to want to check out the weekly SFC Farmers Market held at Republic Square every Saturday from 9am – 1pm, year round. The market features dozens of farmers and food creators, as well as live music and plenty of space for picnics, meaning you can easily make a morning or day of it. 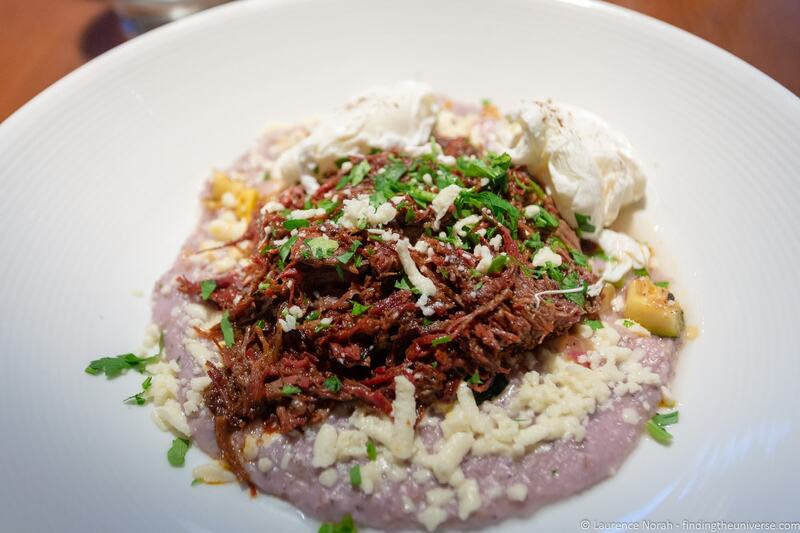 There are also a number of food tours you can take in Austin, such as this Austin Food Tour. These will take you to some of the hotspots and let you sample some of Austin’s more well known dishes. 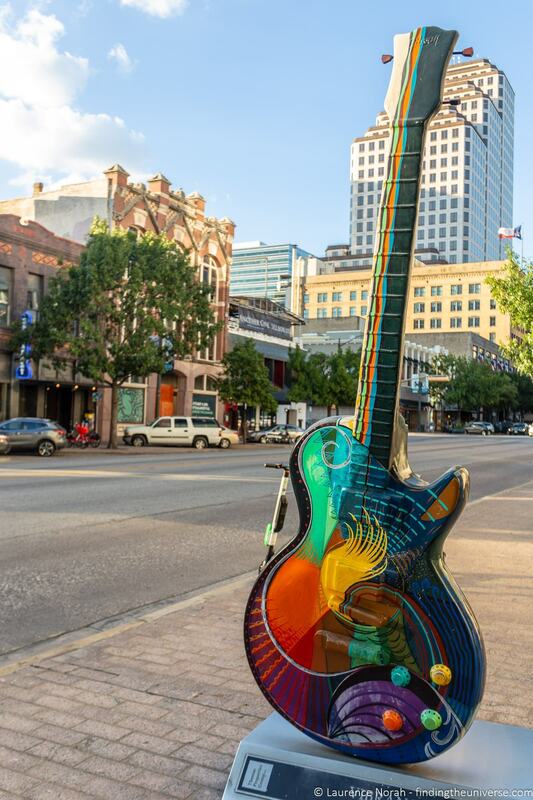 Austin is well known as a great place for entertainment, and the heart of the entertainment is to be found on Sixth Street in downtown Austin. This is not a recent development. Sixth Street has been the beating heart of Austin since soon after the town was founded, although back then the street was called Pecan Street. Pecan Street was the street where the stagecoach into Austin travelled, stopping at the intersection of Pecan and Congress. Naturally, all manner of businesses grew up around such a hub, from saloons to stables, and some of the historical buildings from the late 19th century can still be seen today as you wander along sixth street. As well as history, there are bars and a variety of nightlife options, including Esther’s Follies comedy club, which has been entertaining audience in Austin for over 40 years. There are too many bars to list, but some popular favourites include Midnight Cowboy, Firehouse Lounge and Parkside. Festival lovers might also want to check out the Pecan Street Festival. This has been running since 1978, and features local artists, craftspeople and live music. The festival runs twice a year, on the first Saturday and Sunday in May, and the last Saturday and Sunday in September. 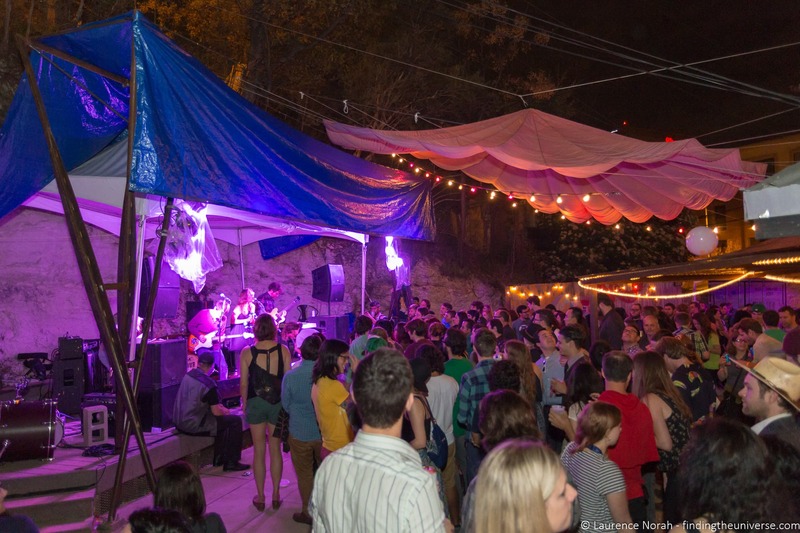 Finally, Austin is a hub for live music, with venues all over the city offering live music on different nights of the week. Even some of our recommended accommodation options regularly feature live music. A great option if you want to see live music whilst you’re in Austin is to take a Live Music tour like this, which will introduce you to some of the different music varieties and venues available in Austin. Austin has a number of art museums you can visit, and we think that the Blanton Museum of Art should be near the top of your list. 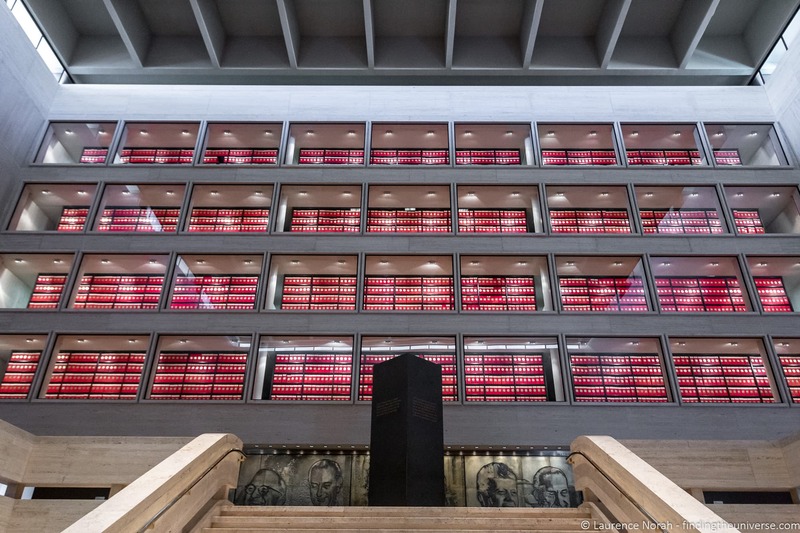 This is a part of the University of Texas at Austin, and the museum is one of the largest university art museums in the U.S.
With a permanent collection that features almost 18,000 works, we think there is likely to be something for everyone. There’s pre 20th century European art, modern and contemporary art from around the globe, and a large collection of Latin American art. The museum is open every day except Mondays, and there is an admission fee. Note that it’s free to visit the museum on a Thursday. You can see hours and admission prices, as well as information on discounts, on the official website here. 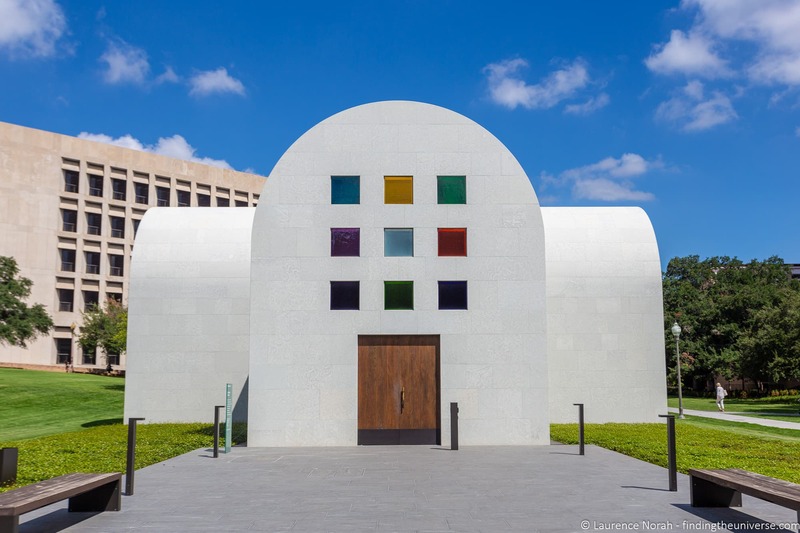 Loves of art may also want to visit the Contemporary Austin, and the Mexic-Arte museum. The former is a community led contemporary art museum, whilst the latter focuses on traditional Latino and Mexican art and culture, both traditional and contemporary. If you are visiting Austin with kids, you will want to consider a visit to the Thinkery, formerly known as the Austin Children’s Museum. This is a 40,000 square foot space filled with exhibits on math, science, technology and engineering – many of which are hands-on and feature play-based learning. These exhibits change regularly, so there’s always something new to see too. Thinkery is open every day but hours vary by day – you can see opening times on the official website here. Note that school groups visit Tuesdays through Fridays from 9.30am – 1.30pm during the school year, and on the same days 9.30am – 3.30pm during the summer, so those days will be busier. There’s an entry fee of $12 for most visitors, with some discounts available for military and other attendees. See here for more. Parking is available at the McBee Street District Garage, with up to three hours of free parking available for visitors. Thinkery can also be reached by bus, see timetables here. 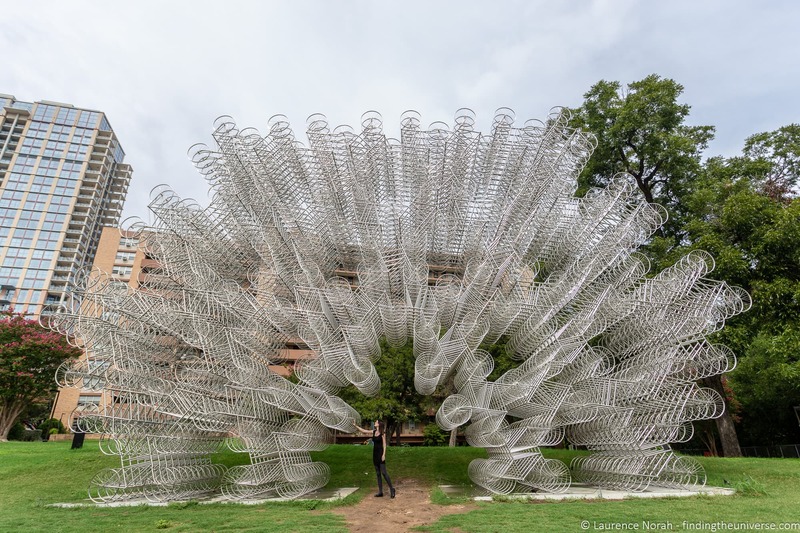 Those of you with an interest in sculpture have a couple of great options in Austin to keep you occupied. The first option we suggest you will enjoy is the Umlauf Sculpture Garden and Museum. This museum and outdoor sculpture garden is home to the work of American sculptor Charles Umlauf. There are four acres of grounds to explore as well as the museum itself. The museum and gardens are open every day except Mondays, with some closures for public holidays. There’s a small fee to visit. Lovers of sculpture will likely also want to visit the Elisabet Ney Museum, which showcases the life and works of sculptor Elisabet Ney, a German-American sculpture artist who immigrated to the USA in the late 19th century. In Austin, she created a number of notable works, including sculptures of Samuel Houston and Stephen Austin. These can still be seen today in the State Capitol building. Work by Ney is also on display at the Smithsonian American Art Museum. The museum is found in her former studio, which is the earliest art studio built in Texas. It is open from 12pm – 5pm, Wed-Sun. Entry is free. If you visit Austin in the summer months, the chances are that it is going to be hot and humid. And what better way to combat the heat (or take advantage of it), than by floating down a river in a floating river tube! There are a number of river tubing tours available, such as this one on the San Marcos River, and this one on the Spring River. Tours usually last for 4 – 6 hours, and everything is included, from round-trip transport from downtown Austin, tube rental, and even coolers for your drinks. All you have to do is bring your own drinks, layer up on sunscreen, and prepare to have fun! If you’re heading to Austin with the thought of getting some serious shopping in, you might want to head out to either San Marcos (south of the city) or Round Rock (just north of Austin). These are both home to huge outlet malls, where you’ll find hundreds of shops across a diverse array of brands. There’s also dining on site, as well as extensive parking. Jess spent a great day out with a friend at these outlet malls replenishing our clothing supplies, and confirmed that they have pretty much everything you could want in one place! If it’s a hot day and you want to cool off but don’t want to commit to a whole day of river tubing, another popular option is to head to Barton Springs Pool. 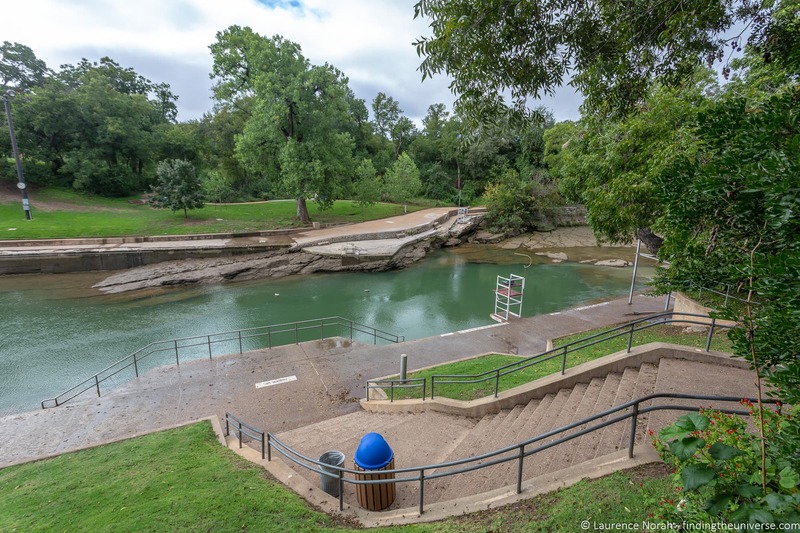 Barton Springs pool is a historic location for swimming in Austin, and in fact, long before the arrival of Spanish explorers, Native Americans were using the natural springs here for rituals. The pool is fed from the Main Barton Spring, which is the fourth largest spring in Texas, and the temperature remains between 68F and 74F year round, meaning this is an excellent place for outdoor swimming, whatever the time of year. The pools are open year round from Friday to Wednesday from 5am to 10pm. There’s an entry fee from March to October from 8am – 9pm – outside these times it is free. The pool is closed on Thursday for cleaning. You can see more about times and fees on the official website here. Near Barton Springs is a large recreational area known as Zilker Park, which is home to a number of attractions, including the Zilker Botanical Gardens. This area is also where you’ll find the Umlauf Sculpture Garden. It’s also home to the Austin Science and Nature Center, a facility which offers educational exhibits and recreational activities that are designed to help visitors increase their appreciation of nature and the natural environment. The centre, which has free admission, is open from 9am – 5pm Mon – Sat, and noon – 5pm on Sundays. There are some closures for public holidays and other events, so do check the official website when planning your visit. Austin Zoo is a not-for profit rescue zoo which is home to over 300 animals, the majority of whom were rescued. These rescues included animals that were unwanted by their previous owners for any reason, including other zoos, as well as animals that were awarded protection following legal review. The 300 animals, which are largely exotic, span over 100 species. At 16 acres, it’s not a massive zoo, but there is a good variety of species, including cougards, bears, primates and alligators. It’s also good value, at around $12 for full price admission, with discounts available. Austin Zoo is also included on the Austin ATX Pass. Note that in March 2019 a report surfaced regarding concerns poor treatment of some of the animals at Austin Zoo. This report originated with staff and keepers at the zoo, who were concerned about some of the policies regarding animal treatment. Zoo keepers at the zoo have urged visitors to not give up on the Zoo and it’s positive mission of providing for rescue animals, which is why we have chosen to keep this activity in our list of things to do, as the funds from visitor entry will keep the animals at the Zoo in care. However, if you have concerns, we urge you to contact the Zoo directly. You can do so via their website, where you will also find pricing and opening hours. If you prefer your museums to be of the slightly zany variety, then you will definitely want to check out Austin’s Museum of the Weird. Found on Austin’s 6th street at the back of Lucky Lizard Curio and Gifts, this museum features a range of odd attractions, from shrunken heads to two headed animals, as well as a variety of other sideshow style displays. There’s also a small wax museum featuring creatures from a number of popular horror movies, and even a frozen block of ice said to contain a bigfoot like creature. Live performers add to the experience. The museum is open seven days a week from 10am to midnight, and tickets are $12 for adults and $8 for kids 8 and under. 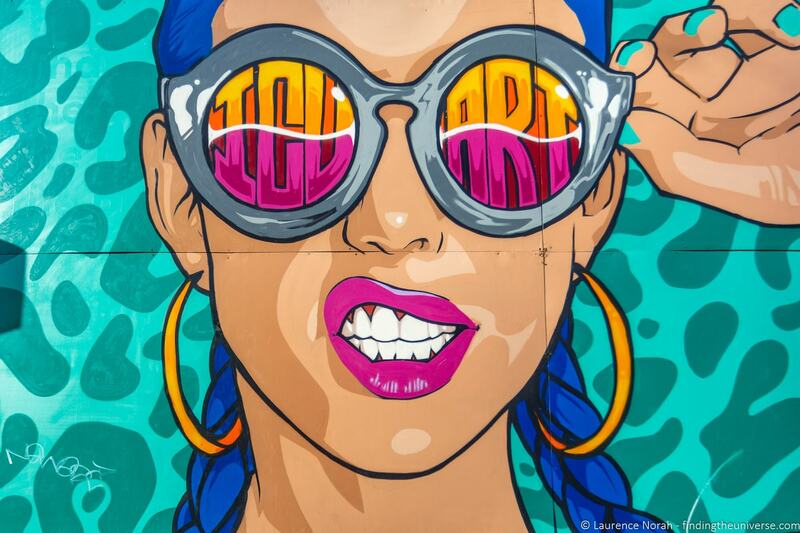 Lovers of street art will definitely appreciate spending a bit of time seeking out some of the street murals in Austin. Austin has long been a haven for artists of all kinds, and there are multiple street art installations across the city. Sixth street and the downtown area in general are good places to wander for street art, although if you venture out of the downtown (any specific area?) you will be rewarded with more street art. If you’re looking for specific street art locations in Austin with addresses, this site has a good list. As you can see, there’s a great many things to do in Austin! A lot of these things can be done by yourself, but there are also a variety of tours you can take as an addition to your trip. We’ve put together a selection of tours you might consider taking in Austin to complement our guide to things to do. Another popular introductory tour is this Austin in a Nutshell bike tour, which includes city landmarks as well as time in some of Austin’s beautiful green spaces. If you want to see the bats, and also a few other highlights of the city, you can take a bat watching bike tour. You can also do a bat watching Segway tour! Want to try some of the best food Austin has on offer, including BBQ? Take a look at this food tour. 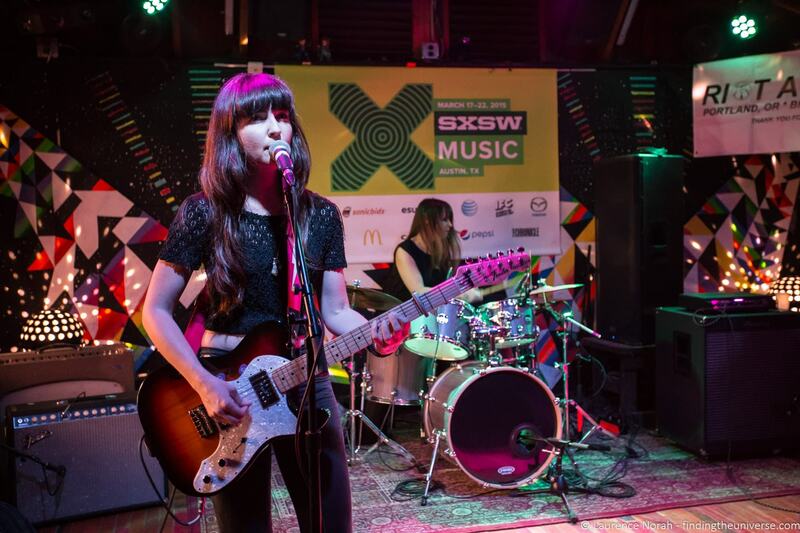 Interested in experiencing live music whilst you’re in Austin? This Live Music Crawl will take you to a variety of venues to give you an idea of what’s on offer. As you can see, lots of options – and there are plenty more to choose from! As always, we do recommend reading recent reviews before booking any tour. Like many cities, Austin has a city pass which can save you a lot of money on sight-seeing, tours and activities. The Austin ATX Pass is offered through the Austin Visitor Centre, and currently costs $85 for three days. 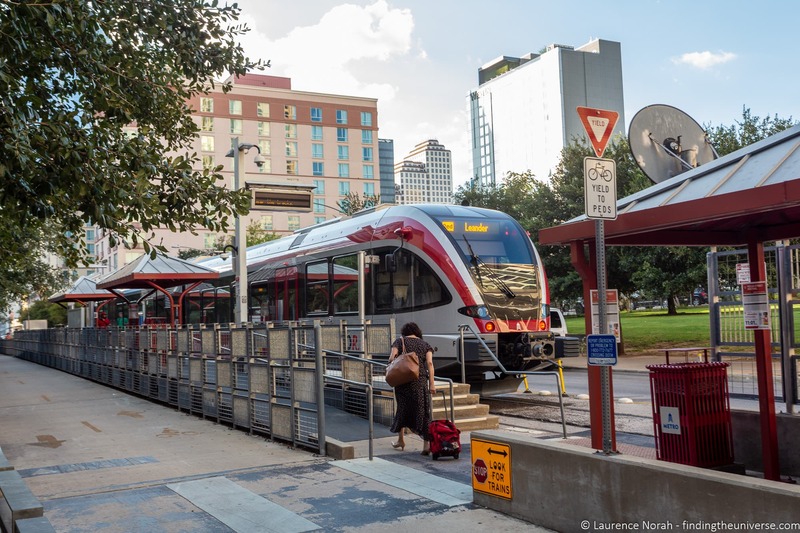 With the pass you get access to a wide range of activities, from walking tours, segway tours and brewery tours, through to bike rental, entry to attractions like the Austin Zoo, LBJ Library and Austin Aquarium. Rather uniquely for a city pass, it also gives you access to upcoming events in the city. These change depending on what’s happening in the city, but can include live music, sports games, theatre performances, and more. You can see the full list of inclusions and upcoming events on the website here, and the pass can be purchased here. We think it’s great value, especially if you take advantage of some of the higher priced options. Being located in the south of the United States, Austin gets very hot summers and relatively mild winters. Snow is possible, but it is uncommon. The best time of year to visit Austin is from September to November, and March to May. During these times, the temperature will be in the 70s and 80s, perfect for sightseeing and attractions. The hottest months are from Jun to early September, when temperatures can average in the mid 90s, and humidity will be oppressively high. We’d advise avoiding this time if you are not used to this sort of heat. Of course, if you have a specific interest in visiting one of the festivals, you will want to visit at the right time of year. SXSW for example is in March, whilst the Pecan Street festival is held twice yearly, in May and September. Do be aware that during festivals and events, lodging prices will be much higher than at other times of year, so if you are not interested in attending the festivals, we highly advise avoiding the city during these times. In addition, if you want to see the bats in Austin, they are usually around from March to October. Austin has a huge range of accommodation options, from large well known brands to smaller budget options. We’ve stayed at a few different hotels in options. Here are some options for your visit to consider. We’ve primarily picked hotels in the downtown area so it is easier to get around, but you can save money by staying a little way out of the centre at properties like this if you are on a tight budget. 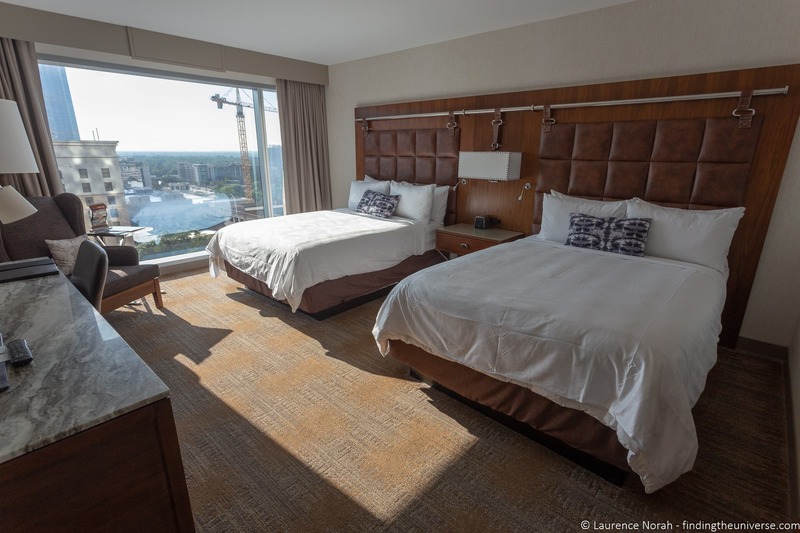 Super 8 by Wyndham Austin Downtown – We’ve stayed at this budget option, which is around a 15 minute walk from Sixth Street. Rooms are very basic, but there’s free parking, continental breakfast is included, and it’s great value. If you are sensitive to highway noise you’ll want to ask for a room at the back. Omni Austin Hotel Downtown – A well rated good value four star centrally located hotel in downtown Austin. Offers a roof-top heated pool and a lounge bar with snacks. JW Marriott Austin – A great high-end four star which is also the largest JW Marriott in North America. When we stayed here we found the staff to be friendly and efficient, the on-site restaurants were great and rooms are very comfortable. It’s right in the heart of downtown too. 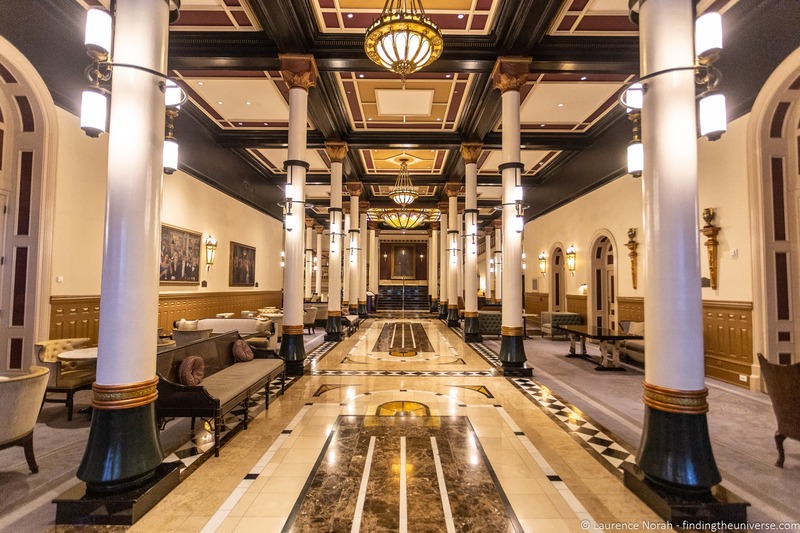 The Driskill – A magnificent and historic four star property right in the centre of the city, offering spa facilities, live music, and an award winning restaurant. Not a budget option, although great room rates are available during low periods. If you are visiting during SXSW or other festivals, expect property prices to be significantly higher wherever you look. As well as the above listings, we also recommend you look at all the Austin listings on Booking.com and AirBnB, and do check out our list of AirBnB alternatives for even more options! Austin is a relatively flat city that is easy to get around on foot. There’s also a good public transport system, which includes bus and rail services. You can see timetables and fares here. Ride sharing apps are also available in the city, including Uber and Lyft, as well a a local non-profit Austin app called RideAustin. There’s also a bike hire system, Austin B-Cycle, if you want to cycle. Finally, electronic scooters seem to fill the streets. We’re not overly convinced as to the safety of these as a transport option, but you won’t have a shortage to choose from in the city! Hopefully this guide has given you lots of ideas for things to do in Austin when you visit. To help you further plan your trip, we have a number of other resources we think you might find useful. We’ve visited a lot of other cities in the USA! See our guides to Things to do in Huntsville, Things to do in Savannah, Things to do in Charleston, Things to do in Albuquerque, Visiting New Orleans During Mardi Gras, Things to do in Cambria and Things to do in Santa Fe to get started! And that’s it for our guide to what to do in Austin! As always, we’re happy to hear your feedback and questions to help you plan your visit. Just pop them in the comments below and we’ll get back to you as soon as we can. Thanks so much for all the great info! We’re from Australia and are about to leave (May 1st) to do a 20-night road trip in NM, AZ, UT, CO. Your blog (and several links) has been great to read and very helpful, thank you! We’re also staying with friends in Austin so looking forward to that too! Our pleasure Alison! Have a wonderful trip, sounds like it’s going to be amazing! Wow! There is so much to do in Austin. To be honest I’ve only ever really associated Austin with SXSW. Although, SXSW is on my bucket list. It looks like I need to visit Austin for many other things!